Observation - Pheasant eggs - UK and Ireland. Description: A clutch of 20 eggs well hidden on the ground, apparently abandoned. Discovered when cutting back cotoneaster in our garden. 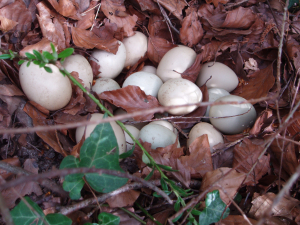 A clutch of 20 eggs well hidden on the ground, apparently abandoned. Discovered when cutting back cotoneaster in our garden.